Potato Facts You Should Know: 1)Americans eat more potatoes than any other vegetable. 2) The potato originated in the Peruvian Andes. 3) Peru has 3000 varieties of potatoes. 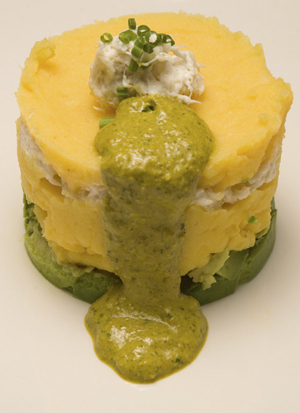 4) Causa del dia (“potato salad of the day”), one of the notable potato dishes of Peru, will definitely be on Mo-Chica’s ninth tasting menu this Thursday, April 29th. According to a Mo-Chica spokesperson, causa del dia and ceviche (a citrus-marinated fish appetizer that is also a signature Peruvian dish) are the only items on the reservation-only tasting menu that can be confirmed. Executive Chef/Owner Ricardo Zarate’s contemporary Peruvian cuisine has popped up on many “Best of” foodie lists lately, so Go Go’ers can look forward to a memorable meal. A native of Lima, Zarate has cooked in Japanese restaurants in London (Tetsuya) and Los Angeles (Sai Sai downtown and Wabi-Sabi in Venice). He brings a Japanese sensibility to the preparation and presentation of dishes both classic (seco de cordero, a “lamb chunk cilantro bean stew with canary beans and salso criolla” per the menu) and contemporary (quinotto, which blends the Andean grain quinoa with wild mushrooms in a non-traditional, risotto-like dish) while respecting the authentic roots of the cuisine right down to the drinks, such as Chicha Morada: purple corn tea of a hue vivid enough to have The Artist Formerly Known as Prince call his tailor. Mo-Chica’s $35, reservation-only tasting menu dinner will be served from 6:00 – 9:00PM; available times for larger parties may be limited. Previous Post CARTOON DUMP: Clinical depression, bad cartoons and Patton Oswalt. Next Post VAUD & THE VILLAINS @ Fais Do-Do: Put the little ones to bed, sugar, and let your hair down.